The stocky grey pony in the paddock harrumphed and tossed his mane haughtily at us when we arrived, demanding our attention. On our way to the cafe, we met Bella, former rescue pooch now happy winery dog, taking a very relaxed approach to her sentry duties. Later, as we crossed the lawn on the way back to our car, she ambled over, tail wagging, for a wet nose kiss. Bella the winery dog, with a belly begging for a rub. 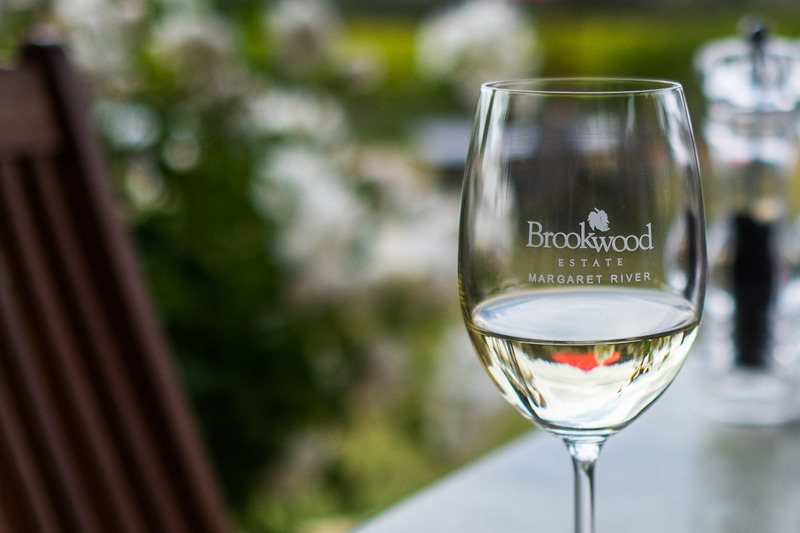 We visited Brookwood Estate as part of our trip to the Margaret River region last month as guests of the Augusta Margaret River Tourism Association. 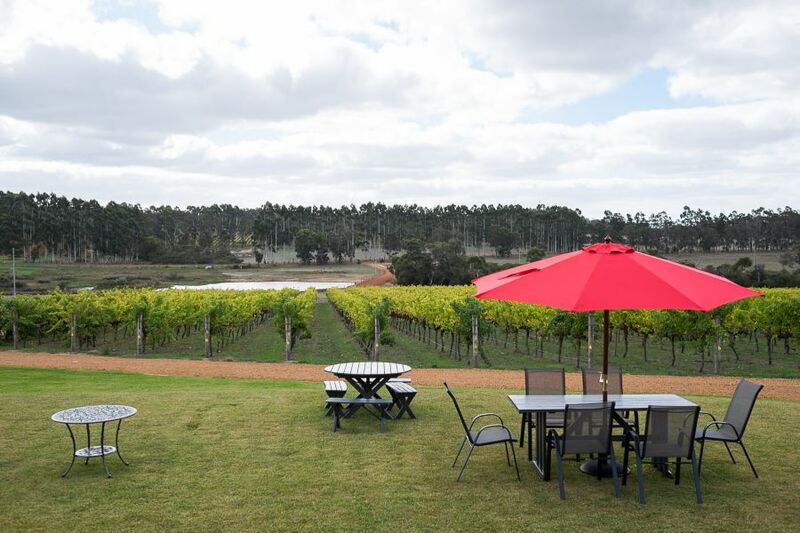 When owners Trevor and Lyn Mann bought the property, it was a dry paddock and they were new to Margaret River and the world of viticulture and wine-making. 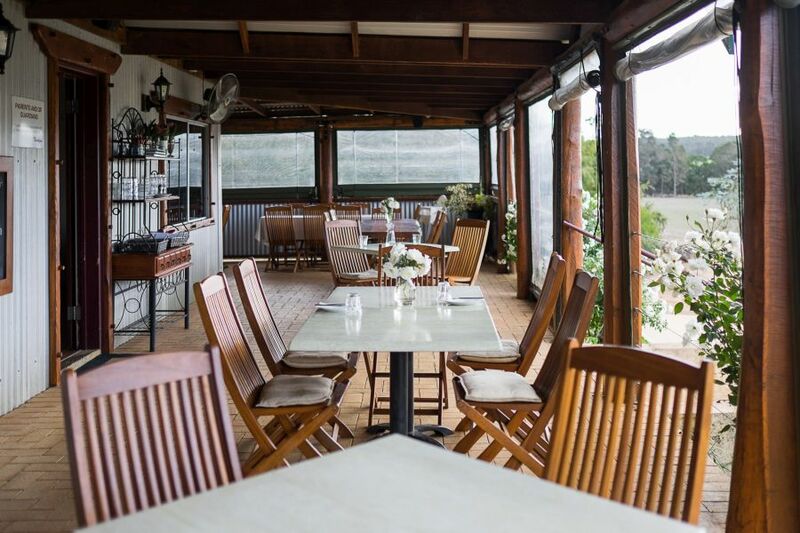 18 years later, they have established a boutique winery, cellar door and cafe they’re rightfully proud of. But there’s no arrogance here; just passionate folk dedicated to delivering great country hospitality and perfecting their craft. The business continues to be family-run and is environmentally responsible. Certified organic fertilisers are used, with no insecticides; residual grape skins and seeds left behind in the wine-making process are used to make compost; food scraps from the kitchen go to the chooks and worms; used cooking oil from the restaurant is converted into bio-diesel to power the machinery that maintains the 6-hectare property; packaging is made from unbleached, naturally matte cardboard; all glass, paper and cardboard are recycled; and safe habitats are created on the property to help protect native wildlife. Learning all of this made us love being here even more. We ordered our lunch but instead of staying at the table, went to the cellar door for wine tasting. 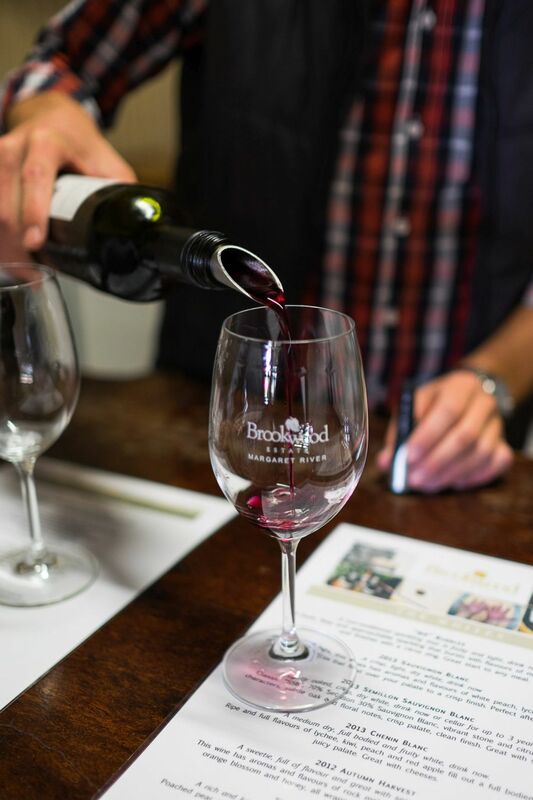 Brookwood Estate’s head wine-maker is Trevor and Lyn’s daughter Bronnley, and the wines are produced in small batches entirely from estate-grown fruit tended to by Trevor. We emerged from the tasting with wine selections to accompany our meal, as well as several purchases to take home: NV Bubbles, which we enjoyed with Jac’s family at Mothers Day lunch the following weekend; 2013 Chenin Blanc (my favourite of the bunch and my choice for a glass with lunch); 2012 Autumn Harvest (fruity and sweet, a good match for spicy food); and the 2012 Shiraz (cherry and plum flavours – think slow-cooked lamb and creamy mashed potatoes by a crackling fire). We had chosen starters featuring the seafood we each find irresistible: for Jac, the blackboard special of oysters natural – Albany oysters, in characteristically petite shells like twisted teardrops, dressed with bursty, zesty finger lime; for me, lightly seared Esperance scallops served with batons of apple, pickled radish and citrus flavours – succulent, fresh and slightly tart. 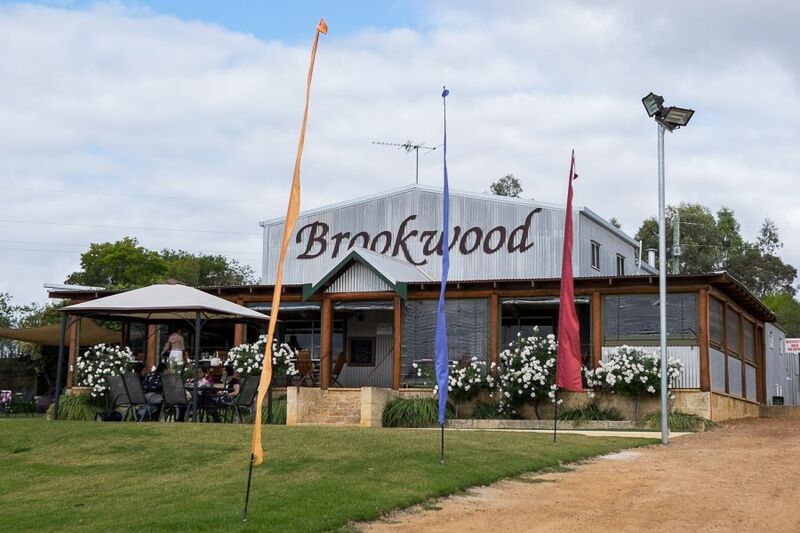 The full range of Brookwood Estate wines are available by the glass or the bottle to enjoy in the restaurant, and they have a range of beer and Little Creatures Pipsqueak cider too. 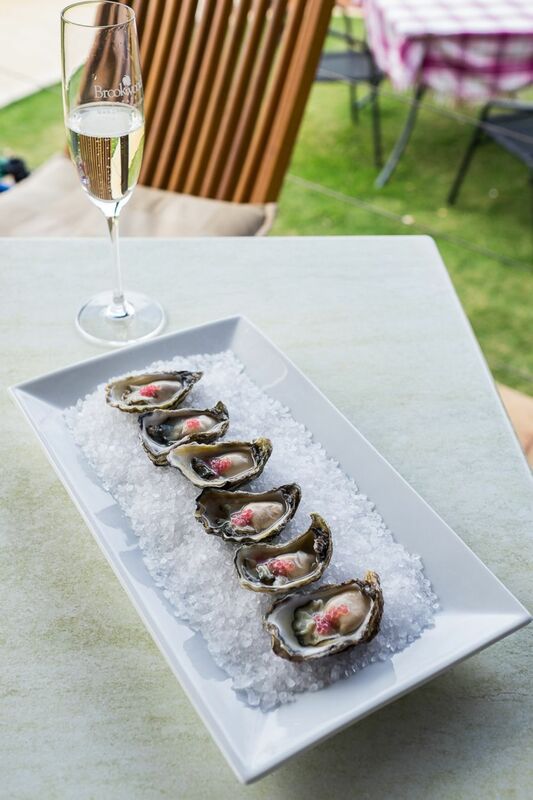 Albany oysters with finger limes (blackboard special) with a glass of NV Bubbles (AU$9 glass). 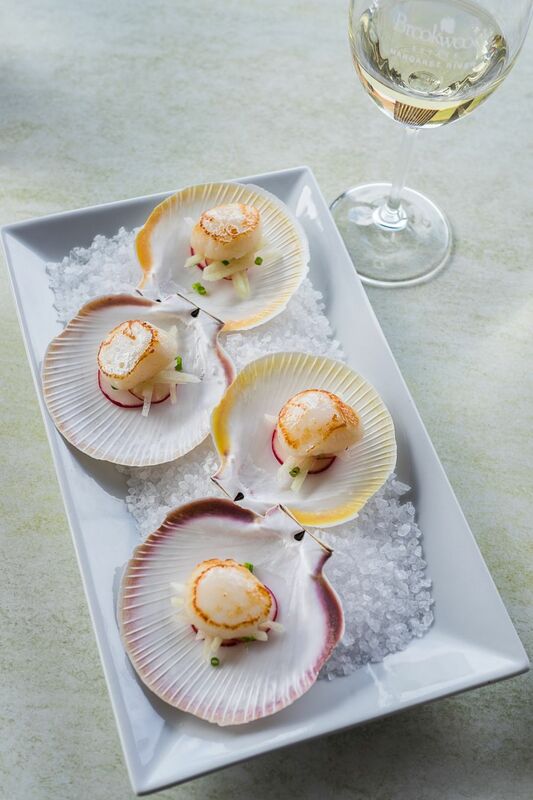 Our main courses presented more beautiful ingredients, exquisite in their simplicity. 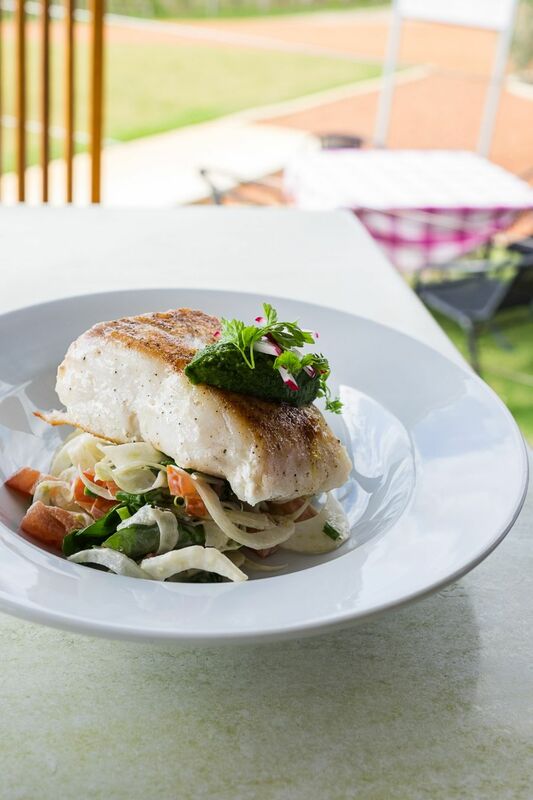 Jac ordered the fish of the day, line-caught in Augusta – a meaty yet delicate fillet of pearly-fleshed groper with a golden crust, served with fennel and watercress salad, topped with salsa verde. I had the fall-off-the-bone forkable confit duck Maryland with lime, pomegranate, and burnt butter pumpkin puree that was so good Jac kept raiding my plate. Fish of the day ($market price) – Augusta line-caught groper, fennel and watercress salad, salsa verde. Jac chose the suggested wine match of 2013 Sauvignon Blanc (AU$9 glass). 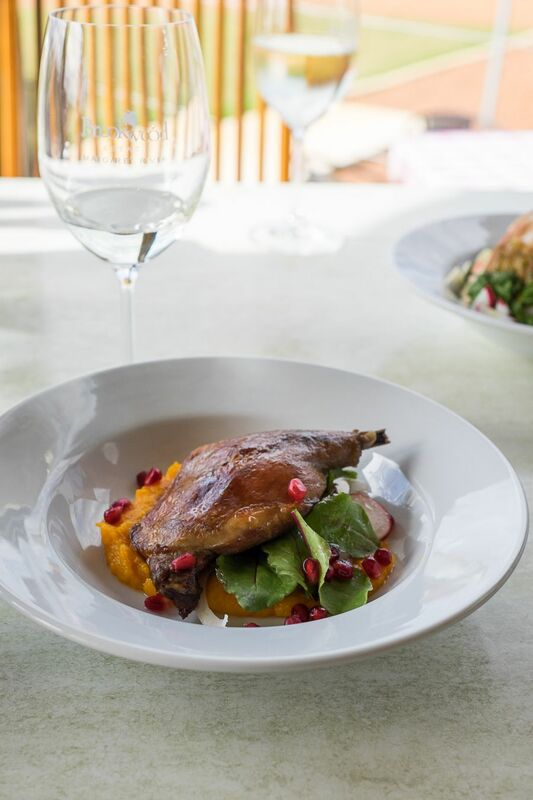 Confit duck Maryland, burnt butter, pumpkin, lime and pomegranate (AU$25). As I am a booze wuss, my glass of Chenin Blanc was sufficient for the whole meal. 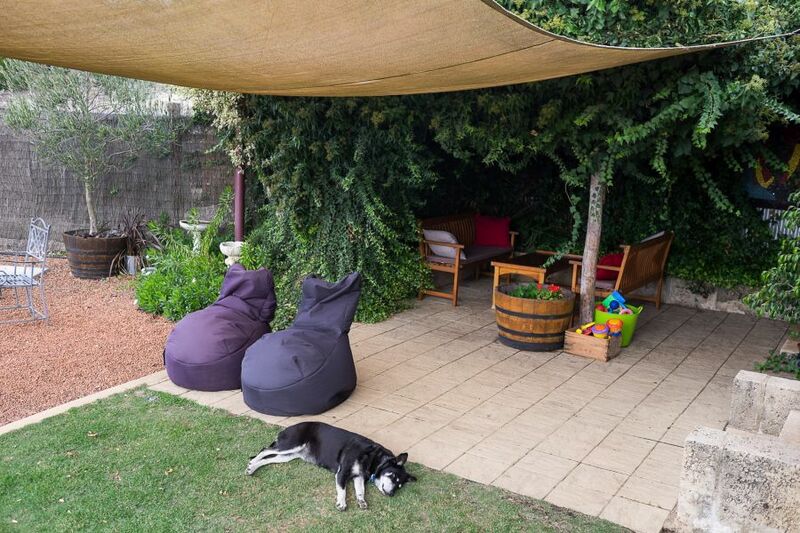 There’s a lot to like about this small winery – gracious hosts, furry friends, superb food and wine, and tranquil, picturesque surroundings. We’d have loved to order dessert or cheese and enjoy it all for longer, but we were expected elsewhere. Next visit’s definitely going to have to be a lazy long lunch. Prices have been provided for your information; our meal was compliments of Brookwood Estate. We paid for the take-home bottles of wine.